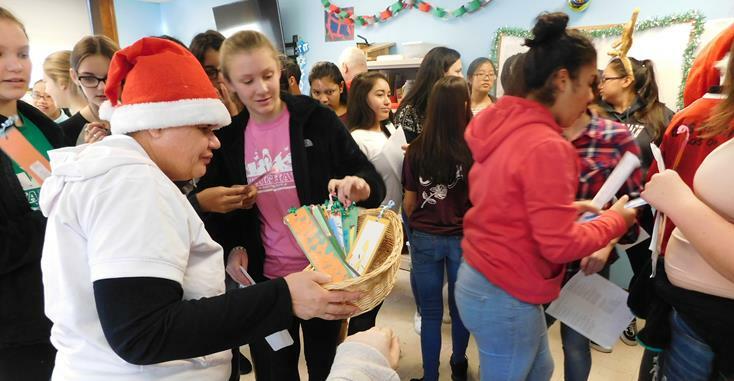 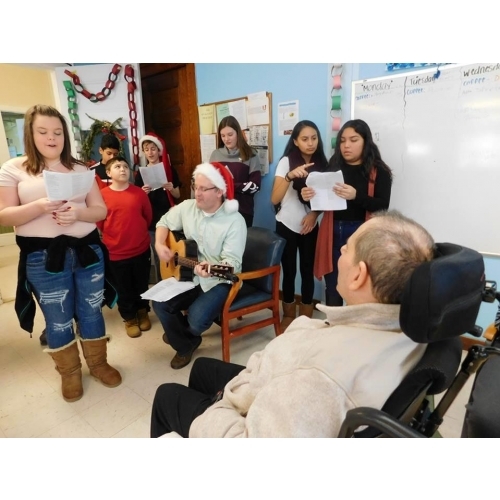 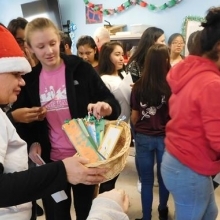 McDevitt Middle School 8th grade students and teachers spread lots of cheer with holiday songs and performances at Chestnut Street and Woodland Road in December. 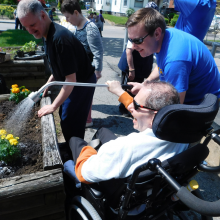 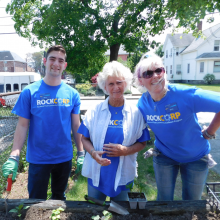 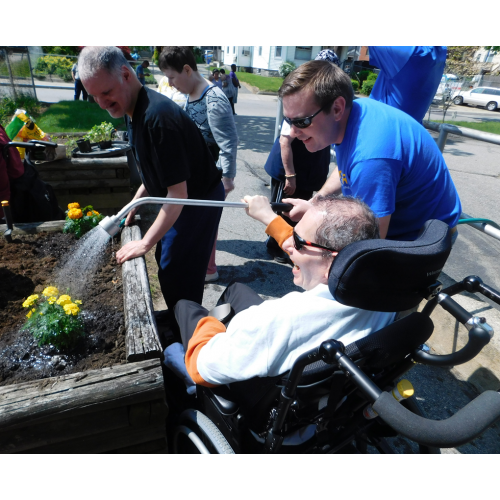 Staff members of the Rockland Trust Moody Street branch visited in May to help Day Habilitation participants plant flowers and vegetables in our raised beds. 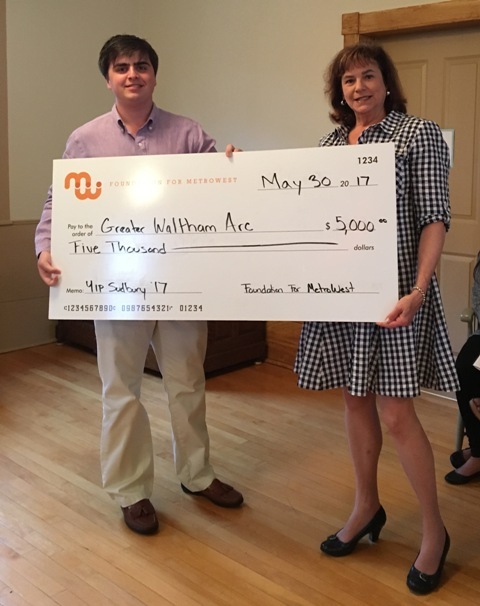 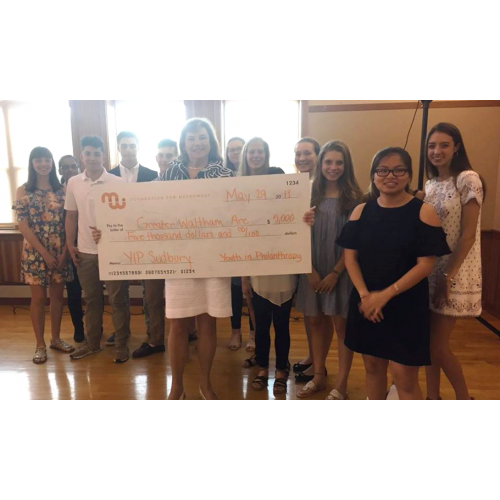 Roz Rubin, CEO, (center) receives a grant check from students in the Foundation for Metrowest Youth in Philanthropy program. 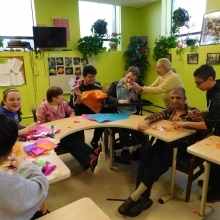 Michelle Bourgeois, a participant in GWArc’s Day Habilitation Program, passes out bookmarks made by GWArc participants to students after their performance. 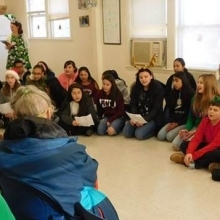 Students visited program rooms at Chestnut Street and Woodland Road. 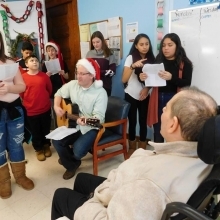 Teacher Kevin Coyne accompanied the students on guitar. 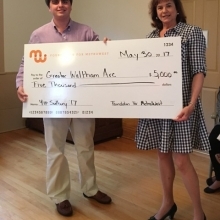 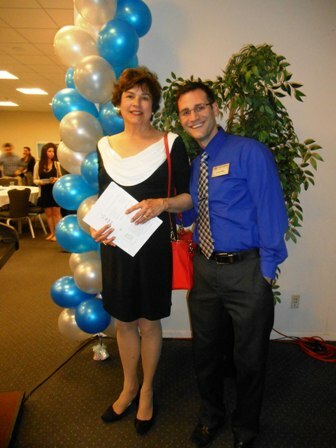 GWArc CEO Roz Rubin is presented a check from the Foundation for MetroWest. 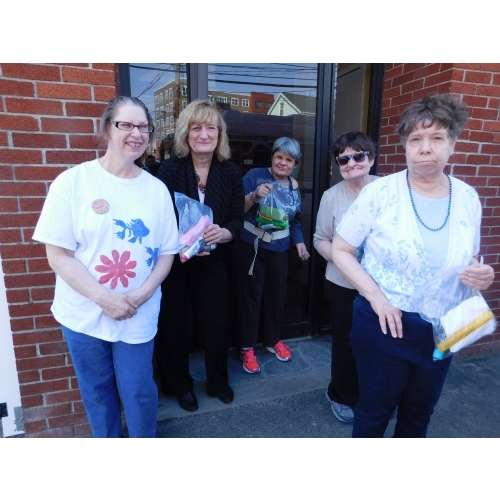 Day Hab participants deliver Ziploc bag toiletry kits they assembled for the homeless to Carolyn Montalto, Executive Director of the Community Day Center (second from left). 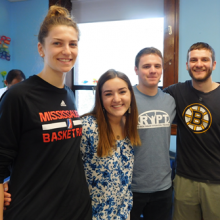 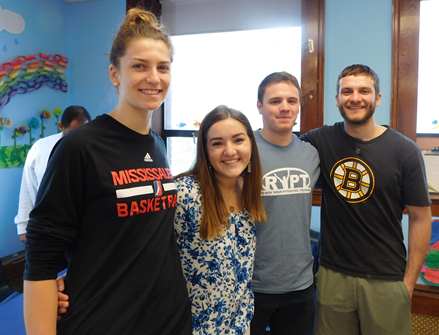 Bentley Service-Learning student-volunteers bid farewell until the Fall. 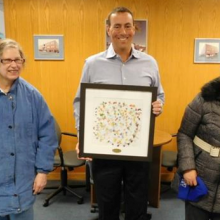 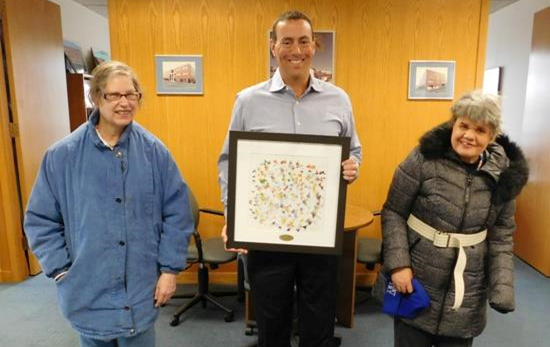 Dan Messina of Hillcrest Properties displays an Artists of GWArc painting delivered to his office by Day Hab participants Mary Ann M. (left) and Michelle B (right). 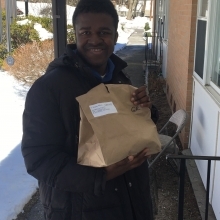 Alex N. delivers a Meals on Wheels lunch to a senior citizen in Waltham. 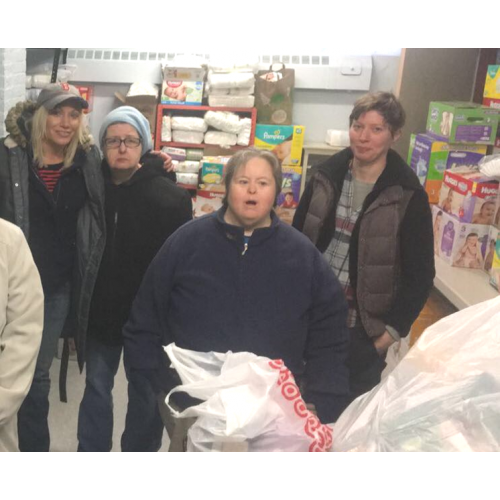 CBDS participants and staff deliver diapers to Diaper Depot, a diaper distribution center for needy families at Christ Church in Waltham. 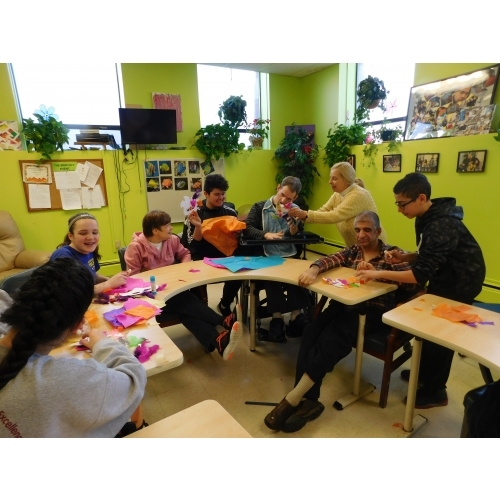 GWArc welcomes twenty McDevitt Middle School students to work with participants on an art project! 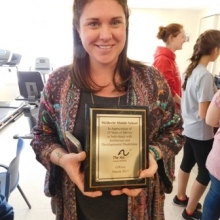 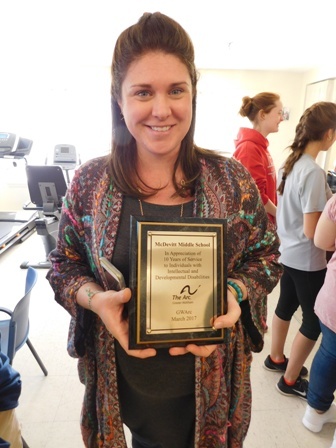 Siobhan O'Connell, McDevitt Middle School teacher and organizer of student visits, receives an appreciation plaque from GWArc. 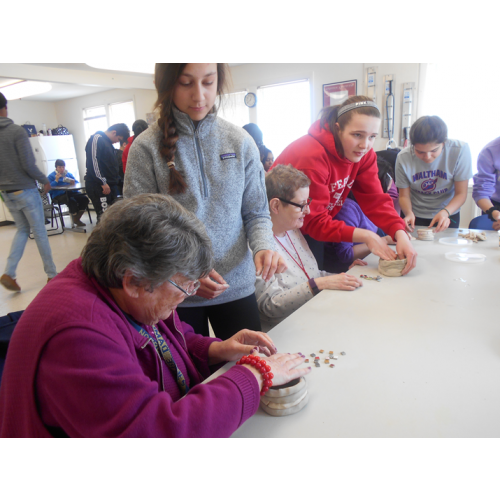 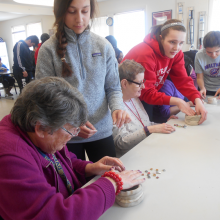 Students and CBDS participants work together to create and decorate clay bowls. 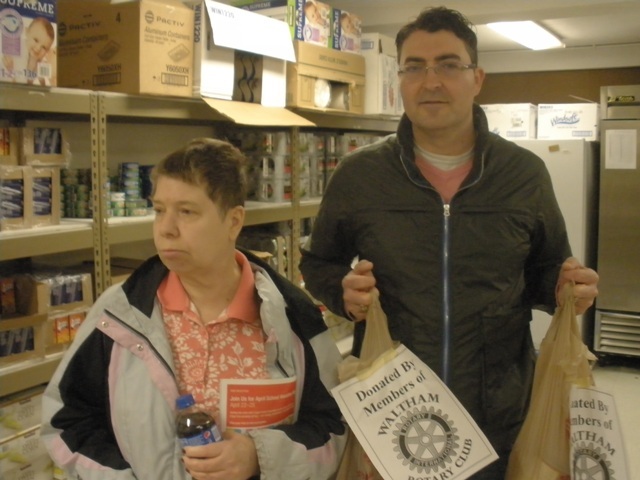 Eddie and Roxie deliver groceries to the Salvation Army food pantry. 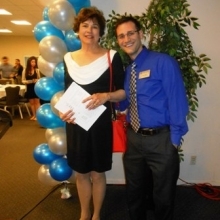 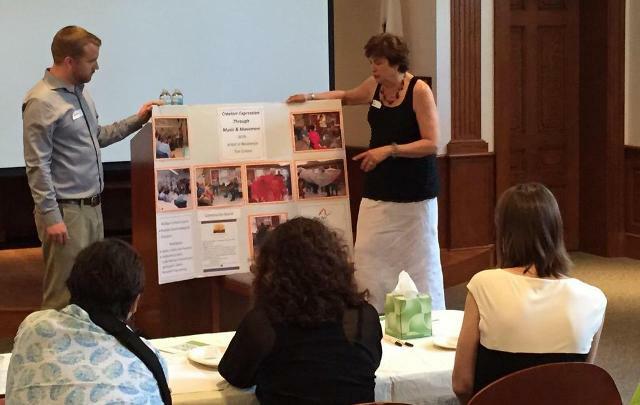 GWArc CEO Roz Rubin was the Community Partner Guest Speaker at Brandeis University's Celebration of Service event in April, 2015. 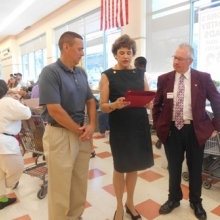 Roz Rubin reads a proclamation from Waltham Mayor Jeannette McCarthy in recognition of the Rotary-GWArc Day of Service for Waltham Food Pantries while Dan Messina, Waltham Rotary Club President (left) and Mike Dunleavy, Waltham Market Basket Manager, look on. 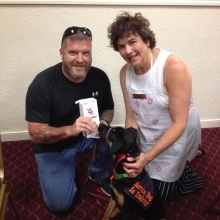 Roz Rubin and Brien Durkee, Purple Heart recipient and Afghanistan war veteran, visit with Scout, Brien’s service dog in training. Roz sold BARK@GWArc dog biscuits, made by GWArc participants, at a fundraiser for Brien in August. 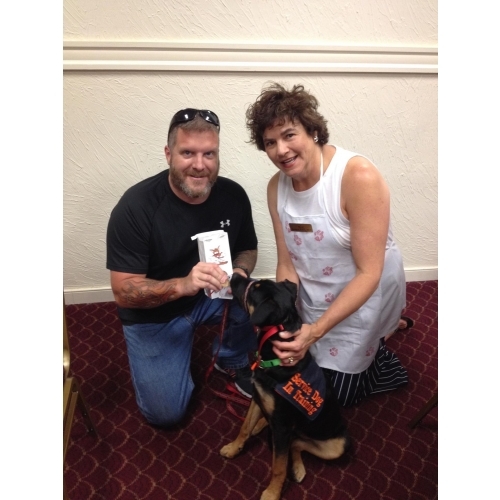 All proceeds benefited training for Brien’s service dog. 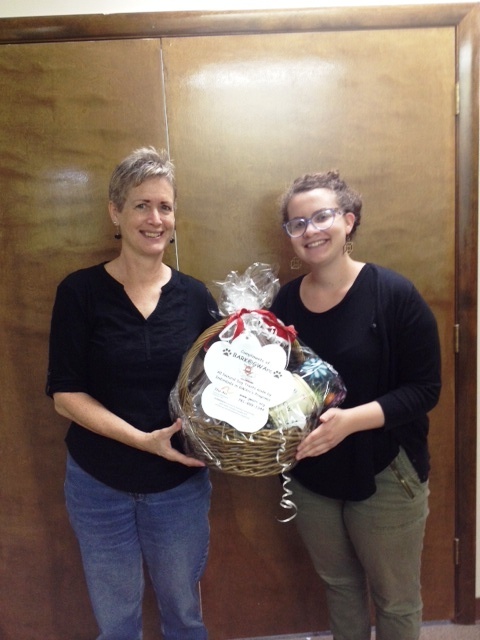 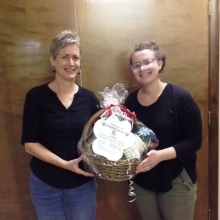 Leah Igdalsky presents Debora Hoffman with a basket of BARK @ GWArc to be used as a raffle prize at REACH Beyond Domestic Violence's Fall Festival. 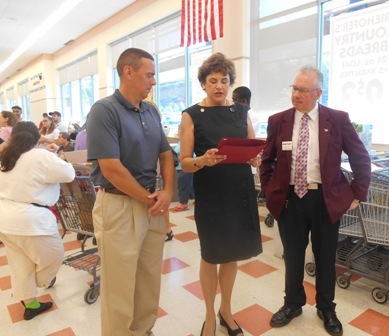 GWArc participant Brian Doucette gets an autograph from Fox 25 meteorologist Shiri Spear during Fox News 25's Zip Trip to Waltham. 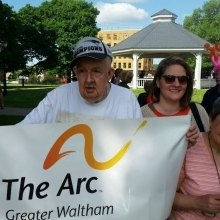 GWArc participants were excited to visit Waltham Common on 5/29/15 for Fox News 25's Zip Trip to Waltham! 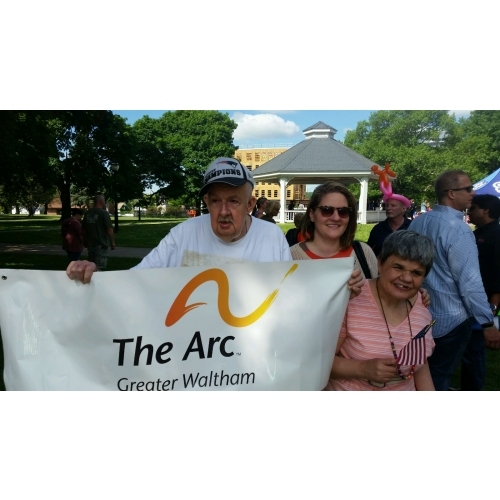 Participants Brian Doucette (left) and Michelle Bourgeois (right) hold GWArc's banner with Katie Hoenigke, Director of Day Habilitation (center). 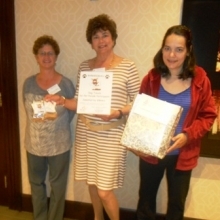 GWArc CEO Roz Rubin (center), presents a donation of BARK@GWArc dog biscuits to Waltham Riverfest 2015 organizers Charnan Bray (left) and Sarah Hanken (right). 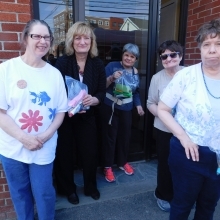 The dog biscuits were given to participants in the Riverfest Pet Parade on June 20. 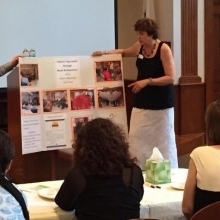 GWArc CEO Roz Rubin presents GWArc's arts program "Creative Expression Through Music & Movement" to members of the Waltham Cultural Council (WCC) on Saturday, May 30. 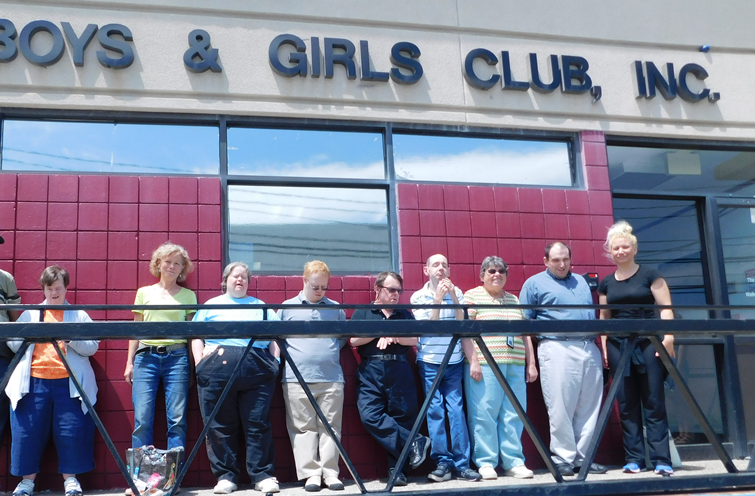 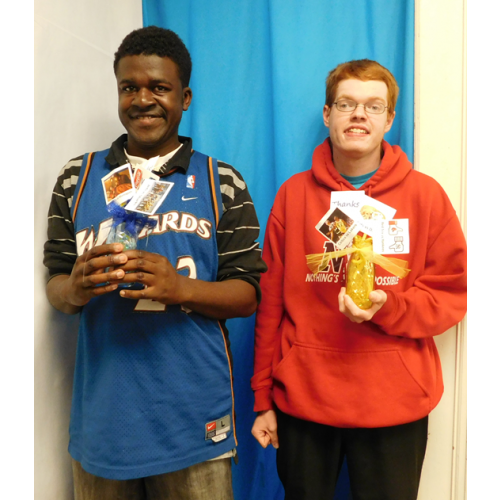 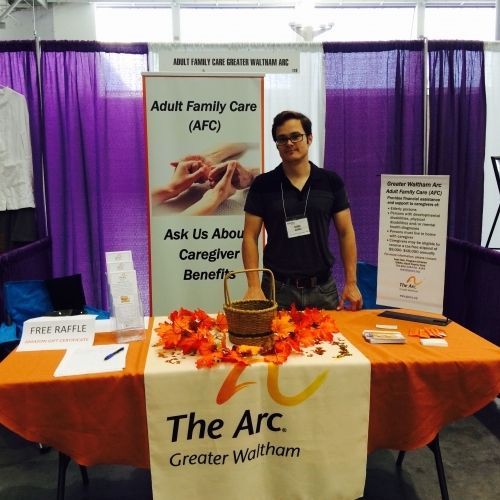 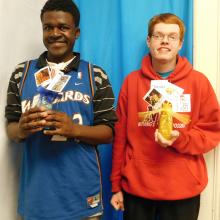 GWArc received a grant from the WCC for this program, which benefits GWArc participants and the community. 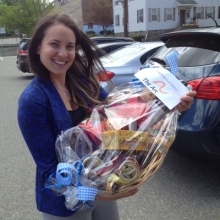 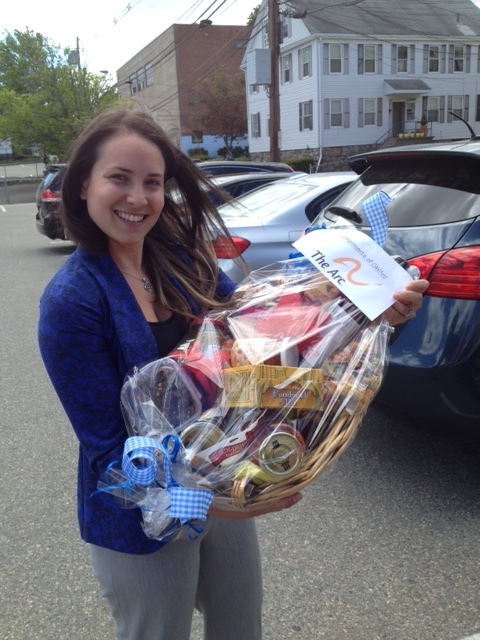 Erica Young, Executive Director of the Waltham Boys & Girls Club, displays a gift basket donated by GWArc to The Boys & Girls club gala. 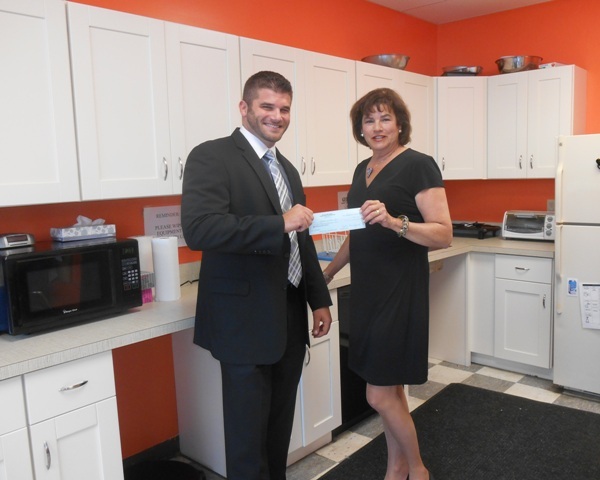 David Felton, Vice President and Senior Business Banking Officer at Rockland Trust, presents a check for $10,000 to Roslynn Rubin, GWArc CEO, in GWArc's updated kitchen at 56 Chestnut Street, Waltham. 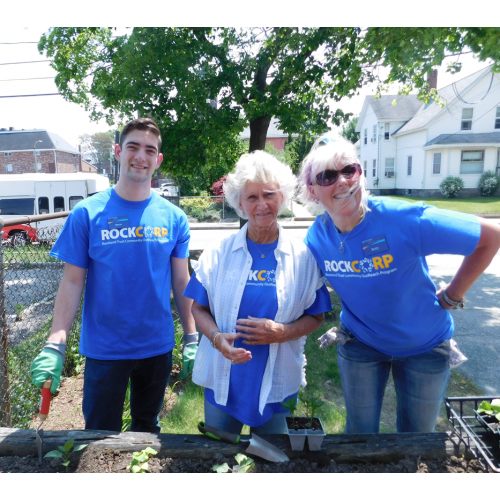 The Rockland Trust Charitable Foundation granted the funds to support recently completed upgrades to GWArc's kitchen and a program room to improve safety and increase space for program activities. 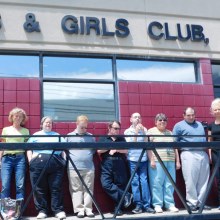 While GWArc continues to seek larger community space, these critical updates allow the agency to maintain quality programs and services. 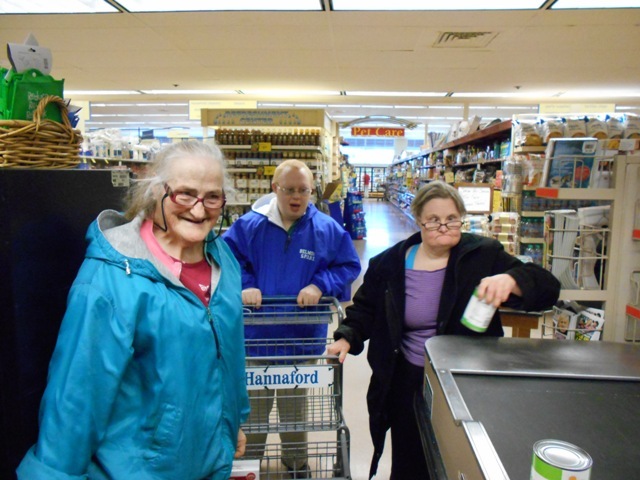 Participants in GWArc's EPT program shop for food to donate to a local food pantry. 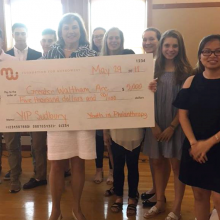 Funds were donated by members of the Waltham Rotary Club. 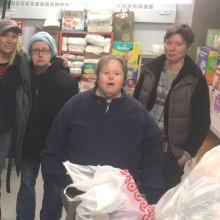 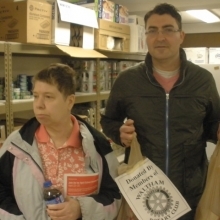 Cindy Davis, GWArc participant, and Peter Cohn, GWArc staff member, deliver food to the Salvation Army Food Pantry on behalf of the Waltham Rotary Club. 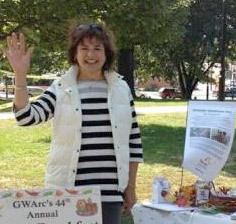 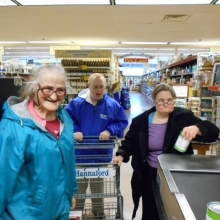 Rotary Club members are collaborating with GWArc by donating funds that GWArc uses to shop for and deliver food to four local food pantries in Waltham. 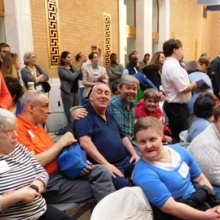 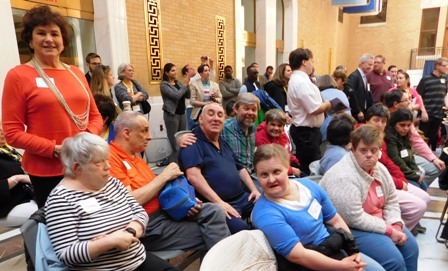 10 GWArc participants and 6 staff members had a great time at The Arc of Massachusetts and Massachusetts Developmental Disabilities Council Legislative Reception at the State House in March, 2016. 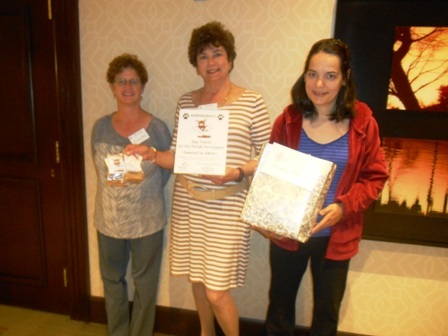 GSE participants were proud to create centerpieces for Waltham Rotary Club's Family Feud fundraiser in June.